According to Preqin’s latest Investor Outlook, as we entered the second half of 2016 institutional hedge fund investors were shying away from event driven strategies. Three percent of respondents to Preqin’s LP survey – the smallest proportion among all top-level hedge fund strategies – indicated that they are planning to increase their exposure to the strategy, with 18% - more than for any other strategy – are actively planning to reduce allocations to event driven vehicles over the rest of H2 2016. However, the Preqin Quarterly Update: Hedge Funds, Q3 2016 reported that 21% of the 118 hedge fund launches recorded in Q3 were event driven strategies funds, representing the strategy’s largest share of launches in any quarter since Q4 2003. The significant proportional increase in event driven hedge fund launches follows a period of strong performance for the strategy. Performance data on Preqin’s Hedge Fund Online shows that the Preqin Event Driven Strategies Hedge Fund benchmark has posted a return of 8.37% for 2016 YTD, the highest of any top-level strategy, despite returns falling by over 3% in the first two months of 2016. Within event driven strategies, special situations and distressed hedge funds have been leading the way, reporting YTD returns of 10.39% and 10.29% respectively. 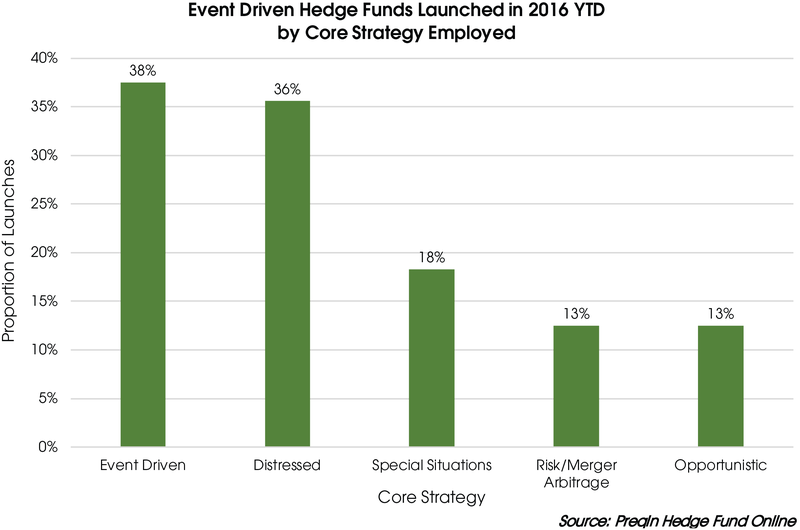 However, despite similar recent performance, distressed strategies were employed by 36% of event driven hedge funds that launched in 2016, double that of special situations (18%). Equity strategies are the most prevalent top-level strategy, employed by 42% of active hedge funds; however, the proportion (38%) of hedge fund launches accounted for by equity strategies funds in Q3 2016was at its lowest point since Q2 2014. Preqin’s most recent Investor Outlook found that 17% of institutional investors were looking to reduce allocations to equity strategies in the second half of 2016, mainly on the back of poor performance by their funds. However, since the survey was conducted, equity strategies hedge funds have posted the highest returns in Q3 2016 (+5.10%) of all top-level strategies, and managers employing these strategies will hope that this performance leads to greater inflows of assets, which could in turn lead to a larger proportion of equity strategies fund launches in future. Preqin’s H2 2016 Investor Outlook also highlighted that a third of institutional investors plan to reduce their allocation to hedge funds in the longer term, suggestive of a difficult fundraising environment for hedge funds ahead. In September 2016, the Preqin All-Strategies Hedge Fund benchmark posted its seventh consecutive positive month for the first time since 2012, with managers hoping that the consistent performance of the industry will improve investor sentiment and stem the loss of assets from the industry.